The Dons return to competitive football following another successful winter training camp in Dubai. The team returned to normal hours this week and the first challenge is facing Stenhousemuir in the Scottish Cup 4th Round. 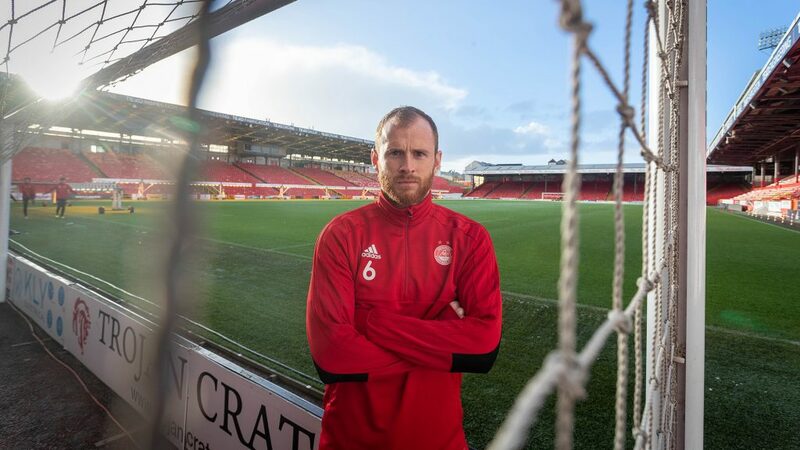 The Warriors sit bottom of League One, but cup football always has a different edge to it and Aberdeen will be more than aware of the threat they pose. Last season The Dons reached the Semi-Final stage and have already made it to one cup final this campaign so will be looking for a return to the national stadium in May. This week the club were boosted by the news that both Max Lowe and Greg Stewart have both returned to the club on loan for the remainder of the season and are available for Saturday’s match. Derek McInnes and the returning Mark Reynolds spoke with the media ahead of Saturday’s cup tie with Max Lowe speaking to RedTV. “December has always been a busy month, no more so than December there. I think since the winter break’s come in everybody looks forward to that and getting a recharge in the batteries and resetting the focus for the second half of the season. In terms of getting away with the players I think just being able to control them in their training environment, their food and drink, the gym work and constantly getting them focussed for the season ahead. “I’m back ready to play so hopefully it’ll give the manager some selection headaches. It just strengthens the team and we said if you want to compete in cup finals and be winning things then you need that strength and depth. Hopefully I’ll bring a bit about that to the team. “It was a real quick turnaround. I was sent back to Derby and played a couple of games there, but I’m delighted to be back and this is where I want to be. I’m buzzing for the opportunity to play with the lads again. “Cup competitions are always the best and hopefully we can reach the final of the Scottish Cup and hopefully win it. 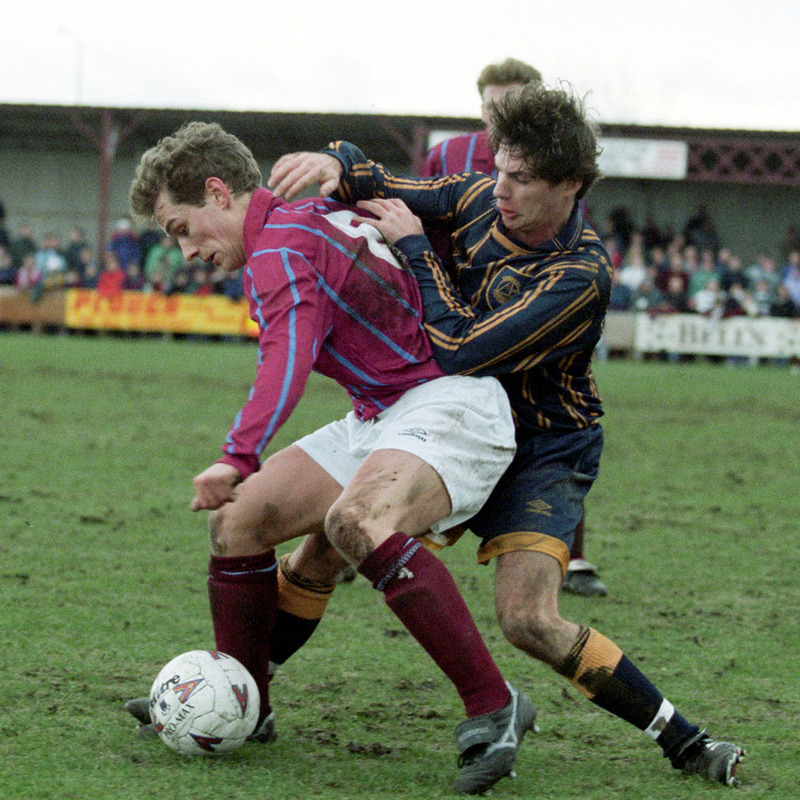 For Stenhousemuir they saw off local rivals Falkirk in the last round and go into this one on the back of a difficult spell that has seen defeats to Arbroath and Raith Rovers. Despite sitting at the foot of the third tier they are only three points off 8th placed Dumbarton. Since that Falkirk victory The Warriors have had a change in management with player Colin McMenanamin taking over the reigns from Brown Ferguson at Ochilview. We caught up with Dons youngster Seb Ross for the red matchday magazine, who is currently on loan at today’s visitors and he gave an insight into the match. Saturday will mark only the fourth competitive meeting between the sides and two of fixtures are historical for very different reasons. In 1903 the newly formed Aberdeen Football Club played it’s first ever match with Stenhousemuir the opposition to Pittodrie. An incredible 8,000 people witnessed the sides play out a 1-1 draw with William McAuley holding the distinction of being the first ever goalscorer for The Dons in a league match. The teams drew once again down at Ochilview later that season and it would be another 36 years before they’d would meet again. With the outbreak of war in 1939 Stenhousemuir and Aberdeen were paired in a regional league with a 6-1 victory going in favour of The Dons and a goalless draw followed at Ochilview. The most recent clash marks one of the darkest days in Aberdeen’s history. Roy Aitken had just taken over at the helm in February 1995 and couldn’t have made a better start with a 2-0 victory over Rangers at Pittodrie. Six days later and it all came crashing down when Tommy Steel struck twice in 15 second half minutes to dump The Dons out of the cup. Amongst the ranks at Stenny is former Dons youngster, Kieran Gibbons, who captained the Development side to the league title in 2015. There is an interview with the 22 year old in the matchday programme. Only Graeme Shinnie and Gary Mackay-Steven of the current Aberdeen squad have played against the Warriors, Shinnie once as Inverness Caley Thistle won 7-6 on penalties in the League Cup and GMS twice, for Airdrie, losing once and drawing the other game when Michael Devlin scored for Stenhousemuir! Michael Devlin played 23 games for Stenhousemuir on loan from Hamilton Accies in seasons 2010/11 and 2011/12. He scored one goal for Stenny. Dons’ youngster Seb Ross has played in 18 games on loan to Stenhousemuir this season, notching up three goals. Warriors’ manager Colin McMenamin played for Gretna, Ross County and Dundee against Aberdeen. If you can’t get to Pittodrie we’ll have live audio for UK listeners and live video for International subscribers. 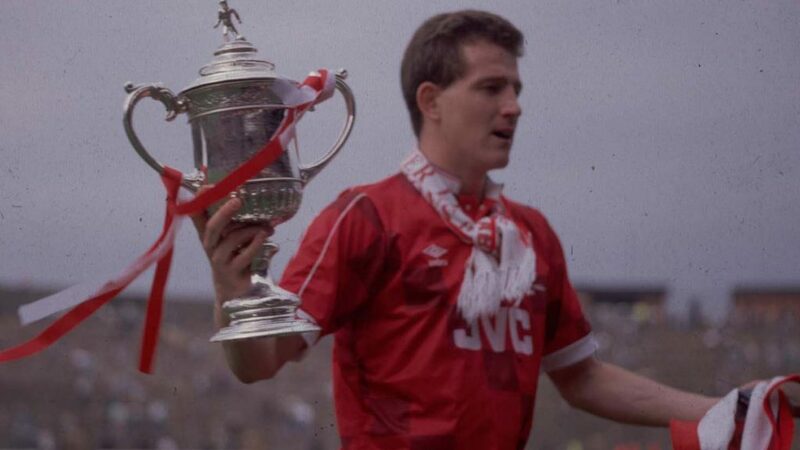 Dave and Andrew will be joined by the last man to score the winning goal for The Dons in a Scottish Cup final, Brian Irvine. Post-match we will have reaction, goals, and highlights from midnight as well as a full match replay. 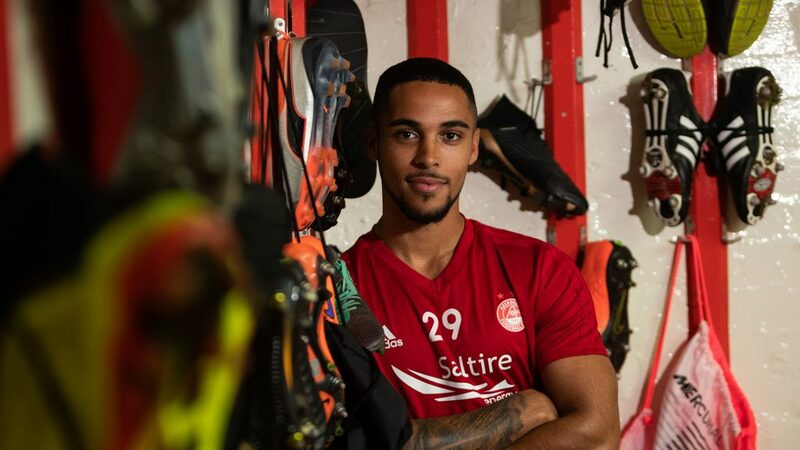 A first half strike from Max Lowe looked to have sent Aberdeen well on their way into the last 16 of the Scottish Cup but The Dons were punished after failing to put the game beyond doubt with a second goal. The Dons now face a midweek replay at Ochilview Park. Fresh from spending the winter break in Dubai The Dons faced Stenhousemuir boosted by the news that Max Lowe and Greg Stewart would be seeing out the remainder of the season on loan at Pittodrie. Both players had impressed during the first half of the season and entered the starting line-up for the Scottish Cup tie against a side who had never suffered defeat to Aberdeen. Lewis retained his place in between the sticks with a back four of Logan, Considine, McKenna and Lowe. Ferguson and Shinnie renewed their partnership in the middle of the park with McGinn, Mackay-Steven and Stewart tasked with supplying the ammunition for Cosgrove. The Dons started the match dominating possession in the Stenhousemuir half, but the visitors were disciplined in their defence and gave little away, Aberdeen would have to be patient to break them down. Patience paid off in the 20th minute when The Dons took the lead as a result of a passing move which sprung to life when Max Lowe skipped past his man with ease before laying the ball off at the edge of the box, Shinnie then got onto the end of a through ball from Stewart and cut the ball across for Lowe to finish from six yards. The visitors played their way back into the match as the half went on but were unable to trouble Lewis. Up the other end the same could be said for The Dons as they enjoyed large spells of possession without creating too many opportunities to test the keeper. At half-time it remained 1-0 thanks to Max Lowe’s goal which had been the one real moment of quality in the opening 45 minutes. There were no changes for The Dons at the break in terms of personnel and the pattern of the game remained the same in the opening stages of the second half with Aberdeen pushing for a second goal. 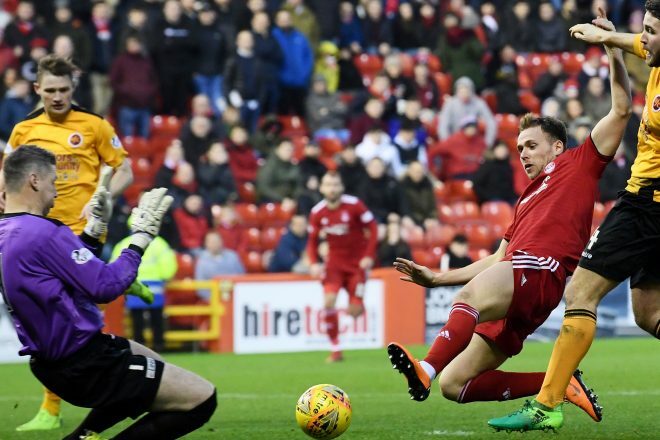 Smith was the first keeper called into action when Shinnie opened up for a shot in the 50th minute, the strike was deflected towards goal and ended up comfortable for the keeper. Moments later McGinn found Mackay-Steven in the area and his shot proved a much tougher proposition for Smith but he was equal to the strike and turned the ball behind for a corner. McGinn was instrumental in the next attack as he produced a great first touch to control a long diagonal before bursting into the area, his pass was perfect for Stewart who kept the ball low and on target but it was saved by Smith. Just after the hour mark McGinn had a strike of his own which was blocked on its way to goal. The rebound fell to Stewart who dinked the ball over his marker and unleashed a half volley from 18 yards out which cannoned off the underside of the bar, it was a glimpse of the form he had been showing for Kilmarnock and unfortunate not to end in a goal. Mackay-Steven, making his first appearance since the Betfred Cup Final, was replaced by McLennan with 25 minutes remaining. The Dons were turning the screw and a second goal looked to be just around the corner but incredibly it was Stenhousemuir who got the second goal of the match to level things up. In the 70th minute McGuigan split the centre halves to get on the end of an inviting cross from Donaldson and he left Lewis with no chance with a powerful headed finish. Out of nowhere The Dons had a job on to try and avoid a replay. 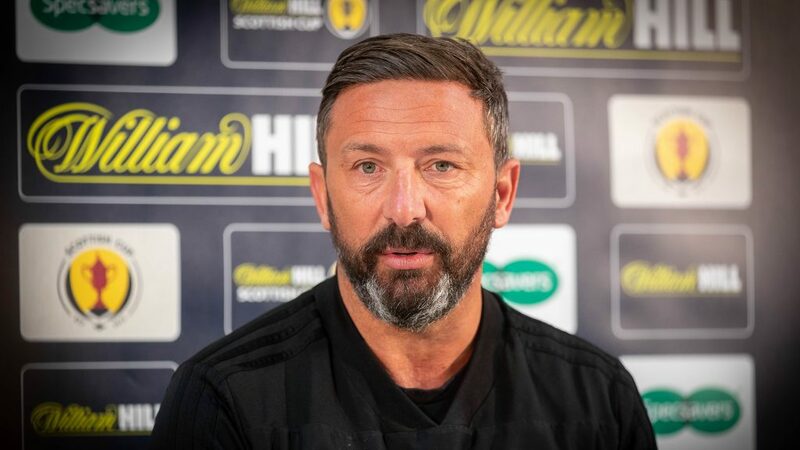 In the 78th minute Aberdeen made their second change when McGinn was replaced by May. With eight minutes remaining Considine got on the end of a corner after positive play from McLennan but his header was straight at the keeper. The Dons were creating half chances with Stewart and McLennan showing good feet in the box but they were unable to test Smith as the game moved towards added time. The visitors were able to see the match out meaning that The Dons would have to wait for their first victory over The Warriors. A disappointing afternoon for Aberdeen who now have to slot a midweek replay in to an already congested fixture list. A much more clinical performance would be required to see off Stenhousemuir and ensure progress to the last sixteen.